A.	I love punk rock. Flatout Jones provides all of the above. 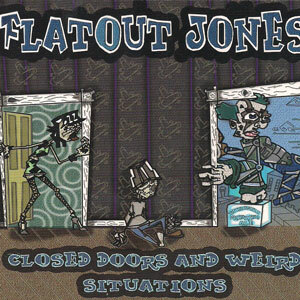 Consider this: the more punk side of Less Than Jake and the ska side of the Suicide Machines; add those together, recalibrate to those settings, set the dial a bit more towards punk rock, plant tongue firmly in cheek and I think you’ll get a decent idea of what I’m picking up from Flatout Jones. In a nutshell you’ve got a punk rock band that isn’t afraid to bring the ska and interject an ample amount of humor into the tracks. Don’t, however, let the idea of humor scare you off, ya know if you’re a totally serious jackhole that can’t for a second let down your guard and everything has to be toughguy or die. … you know who you are. I like party songs. So sue me. The intro track/song makes me think of Killface, that muscular talon-footed fella from Frisky Dingo, Not so much from direction more from intonation and intent. For my money you don’t get better sarcastic humor than that. I digress. You’ll probably want to know a bit more about the music contained on said release.